Light Effects are really popular among photo manipulators. Adding a light effect like rays of light, optical flare or lens flare can really transform your photo manipulation or your photos. In today tutorial I will show you two simple ways in which you can create a lens flare in Photoshop using filters. What is a Lens Flare? In this quick tutorial I will show you how to create realistic lens flare effects for your photos and images. I will show you two useful methods in which you can add sun lens flare in Photoshop in a non destructive way for your images. Open a new PSD file size 1000x1000 px for example if you want to create a big lens flare image. Fill the layer with color black. Go to Filter>Render and choose Lens Flare. You will open the Photoshop Lens Flare dialog box that allows you to add lens flare effect to your image/photo. You can choose from one of four different types of lenses (50-300 mm Zoom, 35mm Prime, 105mm Prime, and Movie Prime) in the Lens Type section. Also you can choose the Lens Flare Brightness. In the mini preview you can see the sun flare effect that is generated. Use the mini preview and drag the flare with the mouse to change the distance and direction. I will show you a preview of each type of lens flare: 50-300 mm Zoom, 35mm Prime, 105mm Prime, and Movie Prime; you can choose the one that you like best. 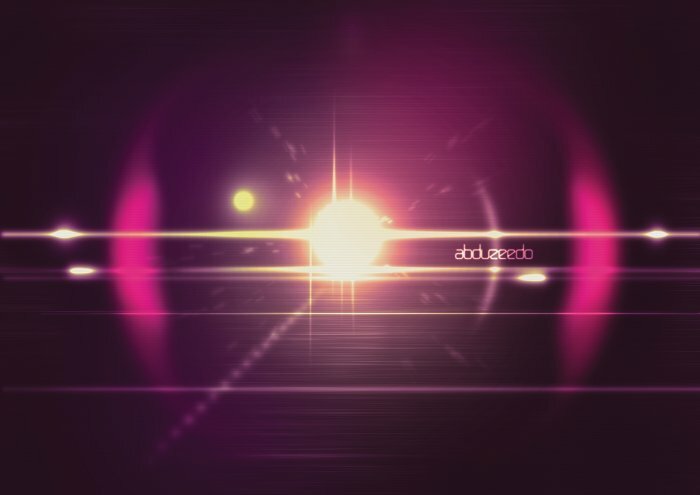 As you can see you now have obtained some interesting lens flare textures similar to these ones. I have used this technique to create my lens flare brushes; all you have to do is to press CTRL+I to Invert the image and than to Define Brush Preset. I will pick the 50-300 mm Zoom Lens Flare type for this tutorial. So here is the result applied to our black color background. Now you can make some Photoshop adjustments to this sun lens flare image. You can add for example Hue/Saturation adjustments with the following settings to change the color of the lens flare. Make sure you add the adjustment as clipping mask for the layer. You can use another method to add lens flare effects to your images; this next method is an easier one but not as versatile in terms of color settings as the previous one. All you have to do is to open your image in a new PSD file. Convert the image layer into a smart object. Go to Filter>Render and choose Lens Flare again. You can see in the preview that instead of the black background from the previous step, tou now have your image. Pick any type of lens flare any click ok.
You can see that the smart object has now attached a Lens Flare smart filter that you can edit without affecting the original image. That way you can easily change the lens flare type, brightness, etc and even replacing your photo with a new one. 6 comment(s) for "Create Lens Flare in Photoshop"
Very good tutorial on how to create lens flare, especially for newbies. I prefer to use the first method, it is more versatile. The best way to add a non-destructive lens flare in Photoshop is to combine method 1 and 2.